William E. Conklin, an. old and respected citizen, died last Sunday evening at his home four -miles southeast of town and his funeral was conducted; Tuesday from the' Presbycerian. church, in Olathe by Rev. A. V. Stout, under the auspice of Olathe Lodge No. 19, A. F and A. M., of which: he was an honored member. He had long been in ill health and his death was not unexpected. 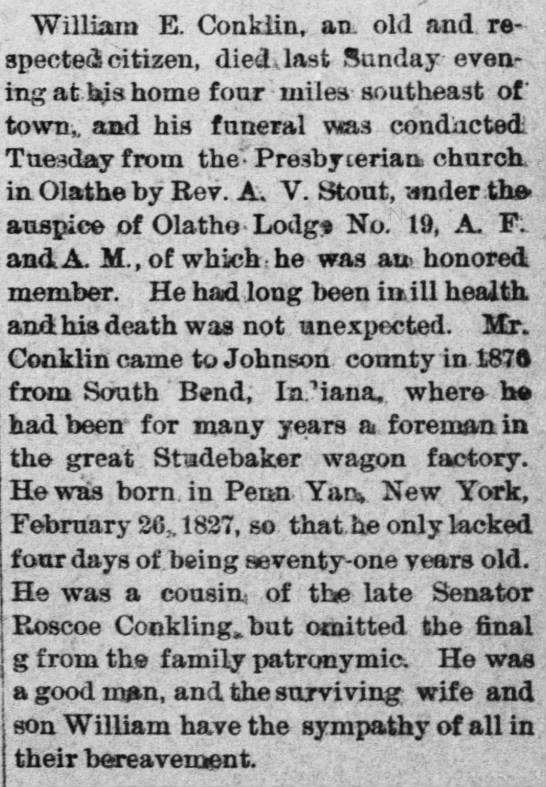 Mr. Conklin came to Johnson county in 1875 from South Bend; Indiana, where he had been for many years a foreman in the great Studebaker wagon factory. He was born in Penn Yan, New York, February 26 1827, so that.he only lacked four days of being aeventy-one years old. He was a cousins of the late Senator Roscoe Conklin but omitted the final g from the family patronymic. He was a good man, and the surviving wife and son William have the sympathy of all in their bereavement. Please share your memories of William E..